The exhibition, featuring paintings and photographs by invited member-artists, also showcases unique inspired winter floral arrangements by the members of the Sogetsu Bux Mont Study Group - a regional non-profit organization of teachers and students of Ikebana - Japanese flower arranging. 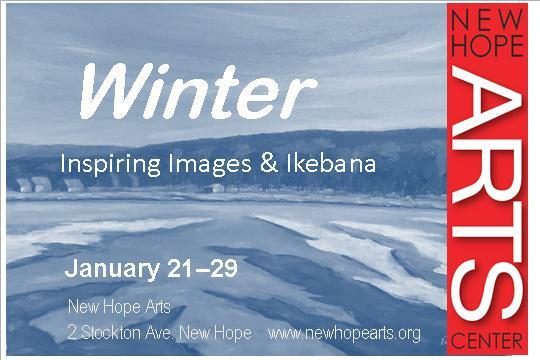 Work by New Hope Arts members Robert Beck, Joe Kazimierczyk, Ernest Koch, Donna D. Lovely, Jan Purcell, Roy Reinard, Carol Sanzalone, Andrea Wallace and Marc Winans highlight the varied views of winter from urban to rural, energetic to contemplative. The flower arrangements reflect with the winter palette also interpreting the moods of the season. Ikebana is artistic, thoughtful and sculptural with a philosophy of aesthetics that requires development and practice. Sogetsu School is deeply rooted in Japanese tradition yet addresses enjoyment and creativity for the modern age. The sensei, or master teacher, Meei-huey Lin of the Sogetsu Bux Mont Group brought her students to the gallery to plan the use of the space and view the art. Installations are carefully measured and constructed on site. Each of the arrangements bears a title, and description of materials along with the artist’s name - just like the gallery art is described. Learn more about this art form and experience the custom installation of floral arrangments created for this special collaboration.